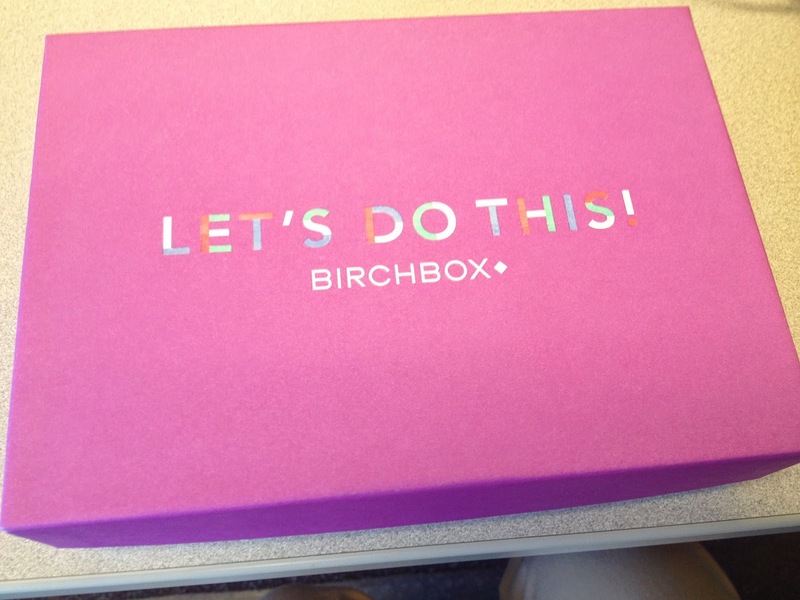 I'm super excited, my sweet sister-in-law gifted me a few months subscription to Birchbox for Christmas. I've been wanting to try out either Birchbox or Ipsy or any one of those makeup subscriptions for awhile now, but given that I'm trying to be budget conscious, just haven't signed up for any. 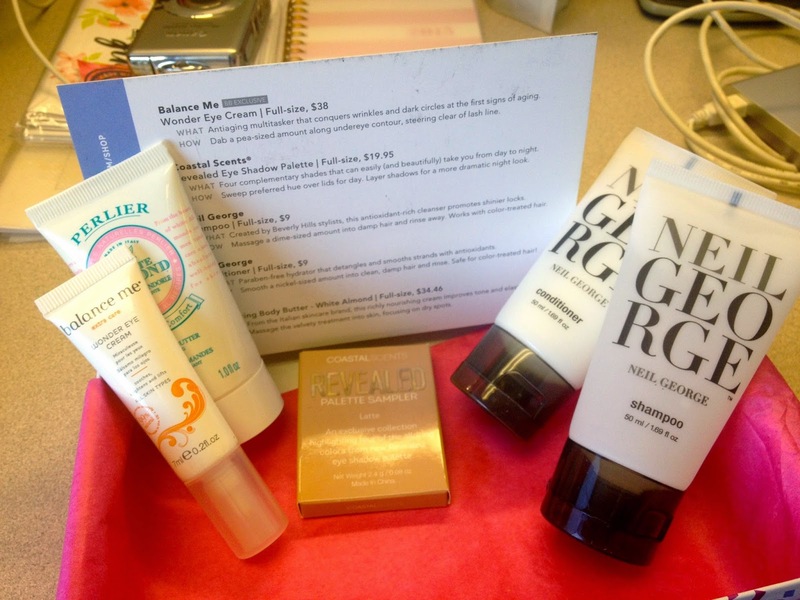 So, getting to try out Birchbox, even for a couple of months, is a real treat! My first box arrived right before Christmas and was a generic welcome box they send anyone who signs up. I didn't take any pictures for review of that box, though I will say there was a perfume sample in that one that I really like and also some great lip stuff. In the welcome box they direct you to go to the Birchbox website and answer some questions about yourself and your beauty profile and based on that they'll personalize what they send you from here on out. So I went ahead and did that. My next box arrived late last week. First off, the boxes are super cute. I'm thinking about using them to better organize my makeup drawer! Anyway, I opened up the box and was pretty pleased for the most part. They give you a card explaining what items you were sent and what a full size item would cost if you decide you want to buy one. Of course you get points/perks/discounts being a Birchbox member too, I haven't figured all that quite out yet. But anyway, on to the goods. First thing on the list is Wonder Eye Cream by Balance Me, which is a Birchbox exclusive. It's an anti-aging eye cream. While I don't like to think I'm getting older, truth is, we all are! Plus, let's not forget, I have a one year old, I am tired. One place that can show is around the eyes, so hopefully this eye cream will help! Next is an Eye Shadow Palette by Coastal Scents. I LOVE eye shadow. Love it. The colors they sent me are nice natural shades, the whole palette is called "Latte" and so the colors are reminiscent of a latte - nice browns and creams. I am excited to try these out. Then we have Neil George Shampoo and Conditioner. Here's the only place I'm mildly disappointed. I could have sworn in my profile when asked I said no hair products. Nothing against hair products, I just have very short hair and very little need for expensive, fancy hair products. At least this is shampoo and conditioner though. I can use them, I just don't want to get sent something like gel or something for long hair. So, I'll be double checking my profile! Lastly is my favorite - Perlier Revitalizing Body Butter in White Almond. Um, amazing. It smells SO good, not overly foody actually. It's a nice sweet scent that mellows to almost a floral. And it is making my dry cracked winter hands feel so good! I'm keeping it on my desk at work since I am doing a lot of frequent hand washing at work! This stuff is great. Why does the full size have to be so expensive?? So, that is what I received in my first box! I am pretty happy overall. I am hoping next month to maybe get some more makeup type items, but we'll see what they send. It's sort of like Christmas all over again, it's a fun surprise! Have you ever tried Birchbox or something similar? What was your experience?